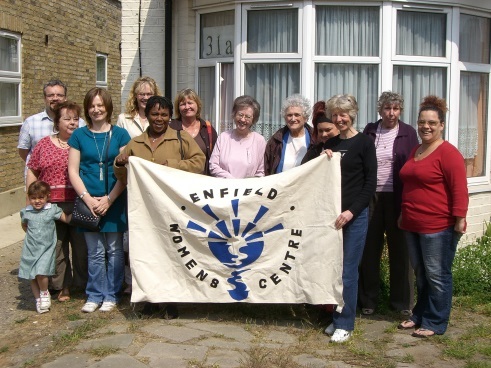 Enfield Women’s Centre (EWC) is a registered charity working for women and girls and their families in the borough of Enfield. If you are a woman or a girl who needs help, get in touch for confidential, non-judgemental support. Where we can’t help we will help you find someone who can. You are not alone, whatever your situation. Things happen or are done to us all at different times in our lives with which we need a helping hand or listening ear. We aim to explore and provide services which will enable women and girls to achieve fulfilment in their lives. These will range from their physical and mental health needs, training, recreational and creative skills. We try to assist women and girls via information, advice or referral on a range of issues including; relationships, violence against women and girls, training, health, through courses, workshops, one-to-one, social activities, etc. The ethos at the Centre is to support women to work towards economic independence where possible and to become stakeholders in their own community rather than passive recipients of services. In particular, we aim to work with women who are disadvantaged and marginalised. We have part-time members of staff who are supported by volunteers. We may from time to time have to rely on answering machines dependent on availability of people and also any activities we may be holding off-site. London Borough of Enfield (LBE) – Currently commissioned to provide services under Equalities Strand, Social Services, The Mayor’s Office for Policing And Crime/ Safer Neighbourhood Boards (MOPAC/SNB) partnership, Corporate Grants, LBE led Lifelong Learning & Skills for Work Partnerships (16+ years), LBE led ESF grant for Access To Learning Project (4 years) Bitesize Community Garden project. Lottery – New Opportunities Fund (Healthy Living Centre), Awards for All. Apologies to any we have omitted. EWC is proud to be funded by the London Borough of Enfield to facilitate providing a voice and services for women and girls in the borough.